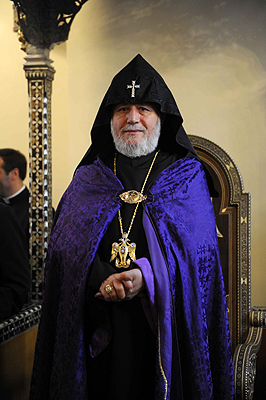 On 14 October His Holiness Karekin II, Supreme Patriarch and Catholicos of All Armenians; sent condolence letters to the families of the victims who died in the Moscow-Yerevan bus crash. The bus was travelling on the Beslan-Vladikavkaz route when the crash occurred in the early morning hours. “We deeply regret occurrence of the crash and pray for our children who are victims of the accident. During this difficult time, we ask for the comfort of the Holy Spirit and offer our support to the families and friends of the victims. We also pray for a speedy recovery of the injured”, the letters stated. His Holiness instructed the Armenian Diocese of Southern Russia to provide necessary spiritual care and support to the accident victims and their families. This entry was posted in News and tagged Armenian Diocese, His Holiness, Holy Spirit, Supreme Patriarch by Orthodoxy Cognate PAGE. Bookmark the permalink.